Photos by Yuhei Iida (top left), Ian Thomas (bottom left, juvenile), and Kelly Fretwell. 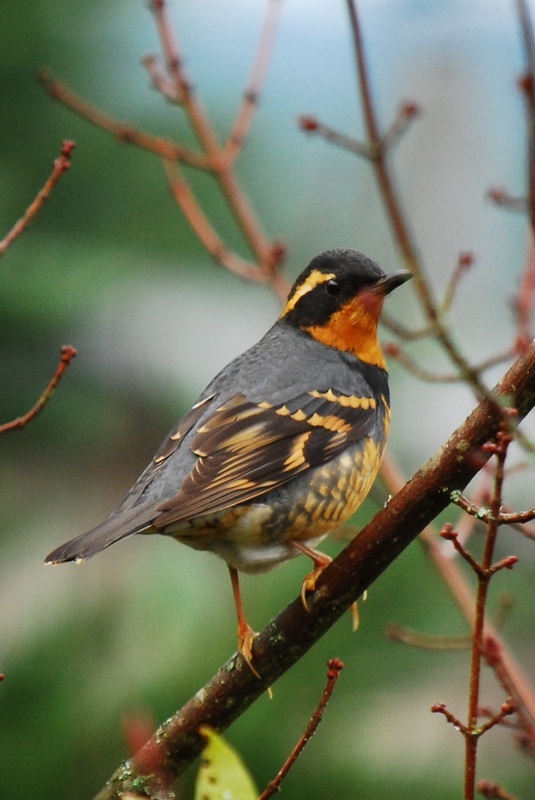 The varied thrush is a large songbird with striking patterns of grey, black, and orange banding. The male and female have the same colouring, but the patterning is much more prominent in the male plumage. 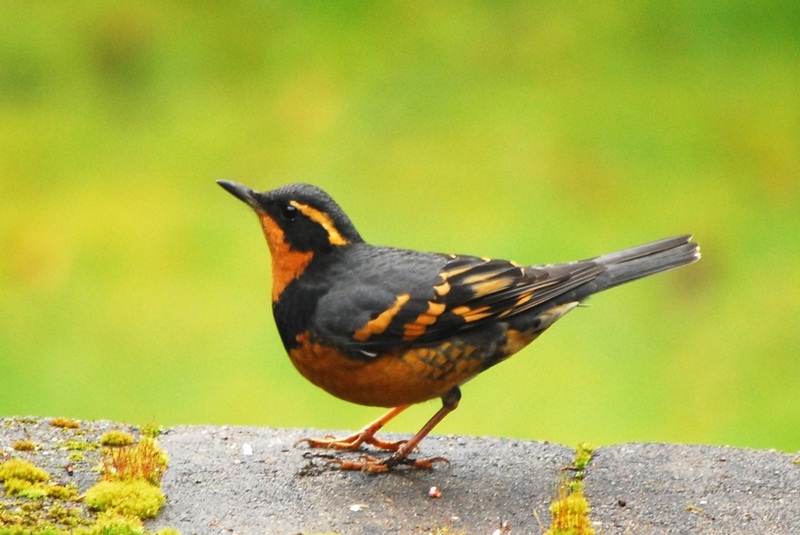 The varied thrush has a dark band running from its bill to behind its eyes with a light orange eyebrow above. It has a dark breast band, which may be indistinct in females, and dark grey and orange banded wings. The male has a dark, slaty grey back, while the female's back is more brownish and muted. Both adults have orange bellies; juveniles can be distinguished by a more whitish belly. This species is restricted to the Pacific Northwest of North America, ranging inland across BC, Alaska, the Yukon and into the Northwest Territories in the summer breeding months. In the winter it may be found as far south as coastal California. It may be found year round on the south and central coasts of BC. 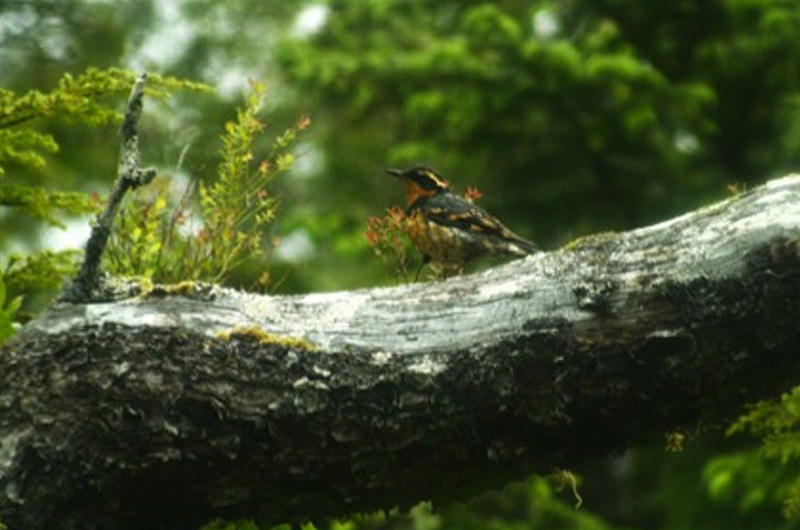 The varied thrush is typically found in dense, usually coniferous woodlands. The varied thrush can be mistaken for the American robin, but the robin lacks the distinctive banding on the wings, face, or breast bar of the varied thrush. 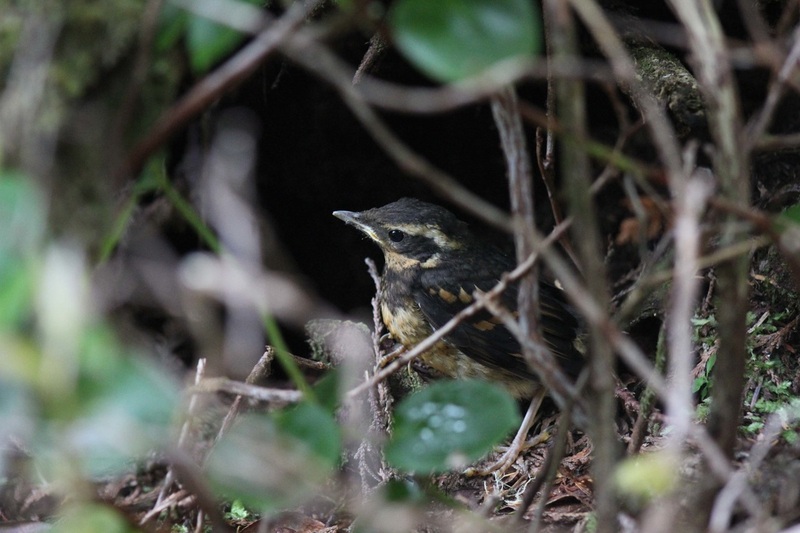 As well, unlike the varied thrush the robin has white streaks on the throat and around the eyes. These two species may sometimes be seen together feeding on worms on urban grassy landscapes. Dunn, J. L. and Alderfer, J. (Eds.). (2006). National Geographic Field Guide to the Birds of North America. (5th Ed.). Washington, D.C.: National Geographic Society. Pp. 358-359.